Over the past four years, Bradley Gee has taken giant steps in every season that he’s played for the South Webster Jeeps, while proving himself as a stronghold at the top of South Webster’s rotation. 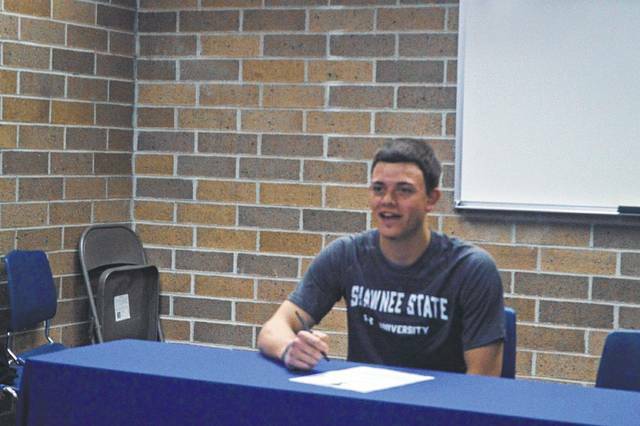 Now, Gee is ready to take the next step in his baseball career — by signing with Shawnee State to play baseball from the 2017-18 season on forward. The senior pitcher, who has also shown off his dual-threat abilities by hitting for power and an average in the middle of South Webster’s batting order throughout his career, made the signing with the Bears official on Monday morning in a ceremony held at South Webster High School. For Gee, the accomplishment is a step that marks the completion of one goal — and the beginning of another. As for South Webster head coach Ryan McClintic and SSU head coach Chris Moore, they believe that Gee’s hard work is evident in how he has played and progressed over his four-year career with the Jeeps. Gee has already proven his ability to work at South Webster, as the Jeep has improved from a contributing freshman who pitched as the team’s No. 3 starter to a powerful two-way threat who has served as the team’s No. 1 starter over the past three seasons while providing a legitimate bat at the heart of the order for the Jeeps. A lot of that improvement is due to the amount of time that Gee put in with Tim Martin, a nationally-renown scout who coached at Minford from 1996 to 2015. Martin also double-dipped as a scout for the St. Louis Cardinals, the Montreal Expos (now the Washington Nationals), the Florida Marlins, and the Boston Red Sox while he was coaching and currently serves as the Associate Scout for the Red Sox organization, a position that he has held since 2010. Moore can tell that maturation and improvement simply in his pitching mechanics. And it’s those qualities that could have Gee in a prime role for the Bears — sooner, rather than later. In addition to the qualities that Gee brings to the table from a pitching standpoint, the South Webster attendee brings more Scioto County flavor to a unit that features Wheelersburg’s Derek Moore and West’s Brady Knittel to the unit. While Moore graduates after this year, Knittel is a guy that Gee has already developed a great repor with — the pair played travel baseball together for Waverly Post 139. “(Chris) Moore is a really good guy,” Gee said. “I know a lot of people that’s playing at Shawnee State right now, so I believe that I’ll fit in well there. It’s great to see Derek (Moore) having the success that he has had there over the course of his career, and I played summer ball with Brady (Knittel), who is an excellent teammate and a guy that I really like playing with. However, Gee wants to finish this year out strong before focusing on anything else.